If there is one thing that can be said for tsuyu (rainy season) is that it is good for canning. Fruits and vegetables so eagerly drink up all that water that they are near to bursting in their eagerness to get off the vine. These days we're gathering zucchini twice a day, and that's saying something. C-chan recently lamented a missed round of collecting as she held an over-sized (by Japanese standards) round green zucchini in her hands. "I can't sell this," she said with a laugh and a shake of her head as a few sprinkles landed around us. "It's American sized!" I joked in an effort to make her feel better, and she promptly gave it to me. I wasn't quite expecting that, although I should know by now that such comments will get me more than I bargained for, i.e. my sushi lesson during our first year. So, home I came with two rather beastly fellows, along with a bundle of rhubarb to share with a friend and for a next round of rhubarb butter. One zucchini went to neighbors who religiously share their compost, but the fate of the other wasn't yet clear to me. It was time to peruse the recipe books and see what inspiration I could find. A recipe for Gingered Zucchini Marmalade in the Ball Complete Book of Home Preserving is what got my mouth-watering. (This is the same book where I found the pickled octopus eggplant recipe last winter.) Ginger is a household favorite as is marmalade. Seemed like a no-brainer. Yet, the recipe called for some rather complicated sounding efforts with the fruit - separating pith from peel, fruity flesh from pith, and so on - which I promptly decided to ignore. Pith and peel add pectin, and that meant I could skip the out-of-season apple. (That's the logic I used, anyway.) I also switched out the two lemons for an extra Japanese mikan and threw in one of the new citrus I met at the Roppongi Farmers Market last month. (Kiyomi's the name with a flavor somewhere between grapefruit, yuzu, and mikan. Super yummy. I'm almost sorry to see it in the marmalade it was so good fresh.) The result are twelve jars - 11 small Japanese-sized jars and one American half-pint - of golden marmalade that is sweet, tangy, and gingery-zippy. Peel and grate the zucchini and plop into the pot. 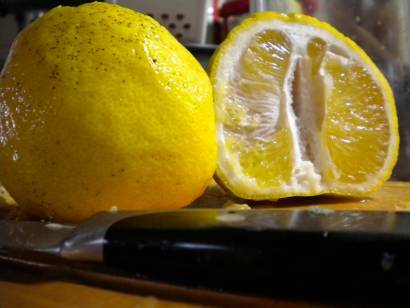 Thinly slice the citrus and remove seeds before sending them to the pot. Peel and grate the ginger and toss it in, too. Mix in the sugar, orange juice, and water and bring to a boil covered. Simmer for about 30 minutes while getting jars, lids, and the rest of the gear in place. 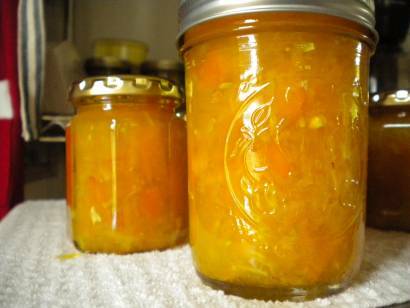 When the mixture gels on the spoon and the jars have boiled well, load hot marmalade into hot jars, wipe the rim, and affix lids. Process for 10 minutes. Ginger - I'd seriously add more next time. I might even replace a portion of the grated zucchini with ginger just to see what will happen come December when it's ready to come out of hibernation. Oh, yes. Apple - The apple is most likely a pectin inducer, but it also occurred to me that it may have been to create more 'space' between the grated zucchini bits. Dense items like pumpkin or mashed potatoes are forbidden items to can (unless cubed and in a pressure canner) for their low-acidity and the challenge of heating the center of the jar to the temperature required to kill nasty things that cause food poisoning. I might be putting that back in or adding another citrus to further raise the acidity and still give space. Mmm. I only recently found ginger marmelade in the store and am hooked. Looking forward to making this recipe... once I have a kitchen again!